The term distal biceps tendon refers to the tendon at the elbow that connects the biceps muscle of the upper arm to the radius bone of the forearm. This tendon can be torn, most typically at the site where it attaches to the bone. A chronic injury is one in which a period of at least six has passed since the injury without any definitive treatment. The treatment for these chronic injuries may be different than for an acute injury (one that is treated within the first four weeks after the injury). In some cases it may be possible to treat these in the same way we treat an acute injury but the complication rate is higher. The need for a graft to reconstruction depends on the extent of the initial injury, the time delay and degree of muscle retraction. The injury typically occurs in men in their fifth decade but may also occur in athletes, especially those involved in contact sports. The cause may be different in these two groups with evidence of tendon degeneration in the non-athlete group. How is this injury diagnosed? The diagnosis of chronic distal biceps tendon rupture is made on clinical grounds by taking a detailed history and performing a physical examination. Typically the biceps muscle will be bunched in the upper part of the arm, the distance between the elbow crease and the biceps muscle with the elbow bent is increased, the biceps muscle does not move on passive rotation of the forearm and the patient will have a positive hook test. In this test the shoulder is flexed forward to 90 degrees, the elbow is bent to 90 degrees and the hand is turned so that the palm is towards the face. The examiner can then attempt to hook their index finger underneath the tendon from the side. If the tendon is torn there will be not tendon to hook the finger under. If there is doubt about the injury then an ultrasound scan may be helpful. Some surgeons prefer a magnetic resonance imaging (MRI) scan. This is best performed with the patient lying on their tummy (prone) with the shoulder flexed to 180 degrees and the elbow flexed to 90 degrees with the palm facing the top of the head (Flexion Abduction Supination (FABS) view). Chronic distal biceps tendon tears can be left untreated if the individual is managing daily activities, occupation and hobbies without pain or weakness. Some people will notice that the arm feels weaker, especially for activities that require a strong twisting motion such as using a screwdriver. Others may experience a cramping type of pain in the biceps muscle. Many men simply do not like the appearance of the arm because this injury will typically cause bunching of the biceps muscle and a characteristic Popeye sign. If the individual has symptoms these can be addressed by bridging the gap between the retracted biceps muscle and the radius bone. This can be done using a tendon tissue graft taken from the patient themselves (autograft) or from a tissue donor (allograft). Both techniques have advantages and disadvantages. The main advantage of the autograft is that there is no risk of transmission of infection from the donor to the patient, however it does mean having surgery at two sites in the body, as the graft is most commonly taken out of the leg, and this may be associated with complications. The graft from a tissue donor avoids this second site surgery but in theory there is a very small chance that infection could be transmitted from a donor to the patient. There are no descriptions of this ever having happened. 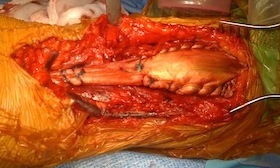 The most commonly used donor tissue is achilles tendon graft (taken from the back of the heel of the donor). All surgery carries risks. The risks specific to this type of surgery are of infection, nerve injury, elbow stiffness, fracture of the radius, bone forming in the soft tissues and graft failure. The risks can be minimised by carefully following the instructions given to you by your surgeon and physiotherapist. What could I expect as the outcome following this procedure? In most cases the reconstruction is performed without complications and will result in an elbow with full range of movement, more normal muscle contour, no muscle cramps and improved strength. There will be two short scars on the front of the arm. Professor Watts has published a new technique for reconstruction of the distal biceps tendon. This is the largest reported series of a single technique with good function and satisfaction reported by patients.